I’m happy to report that things are humming along at Carrot Condo in spite of The Rest Of My Life interrupting every which way it can. This seems to be one facet of living a creative life–the rest of life gets jealous and pushes back, frequently and rather roughly. Again and again, I’m forced to the edge of a cliff named by Yoda fans: Do Or Do Not. Standing at the edge, I see that I can keep pursuing creative work in spite of everything else, or I can stop. Simple as that. And, though I occasionally hesitate, I’m here to say that I keep choosing the creative path. This is partly because of you all, of course, following along and encouraging me … and shopping for that matter! I’ve nearly sold out of a few things–thank you! So, some updates that might interest you. I committed to doing 100 days of practice again. For 100 days straight, I’m drawing an image from my domestic/homemaker life and posting on Instagram. 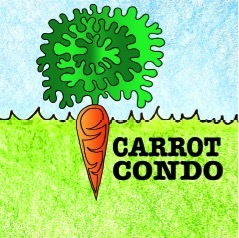 You can follow at carrot.condo or #carrotcondo #domesticartifacts #100domesticobjects. This daily practice is helping me clarify and develop a creation for Carrot Condo that I’m really excited about, but it’s proved more complex (and interesting) than I’d realized at first. Also, while grumbling on Instagram about my failed Altoid tins for my teeny-tiny stationery, I took a leap and reached out to a few professionals. I may have hit the jackpot with one print shop run by artists who understand what I’m trying to do with my illustrations and tiny stationery. So, I’ve got some work to do, but I’m feeling optimistic that I’ll have a new version of tiny stationery to show you in a couple of months…probably with teeny-tiny stickers! Lastly, my friend Robin Vada and I will be teaching our Opening Creative Minds workshop at Compose Creative Writing Conference on Saturday, May 18th. We combine gentle yoga, guided meditation, and writing prompts to unlock creativity and a feeling of confidence and optimism about creative work. Come see us in person at Clackamas Community College in Oregon City. Thank you, as always, for following along and for your encouragement. Carrot Condo’s Etsy shop will have full “shelves” in September displaying all of my 2019 creations. Until then, I’ll have more success-and-failure stories for you! My good friend inspired this card because of the hard work she devotes to making life better for everyone she meets. I’ve become convinced that our daily actions contribute as much to the world as the Big Actions reported in the news, and I wanted a card that acknowledges this. March is women’s history month, and Oregon’s state motto and the Silverspot butterfly featured here are perfect for the strong women in your life who could use some encouragement, congratulations, and love. This card commemorates the daily effort of my friend, myself, and others like us who try–moment by moment–to be kind, generous, and accepting. This can be taxing and difficult, and the Silverspot butterfly featured here represents the resilience we acquire as we try each day. The Silverspot also symbolizes the power of the small–both the resilience of the delicate-seeming butterfly, but also the early-blooming violets it depends on that grow along the Oregon coast. The habitat for these violets (and butterflies) is shrinking and changing. And yet, the Silverspots burst forth each year, continuing their journey even as it gets more challenging. After coloring my line drawing, I took it to a local printer for a fine-art-quality print on smooth paper. Then I hand-stamped each envelope with a design I carved and inked in green that compliments the hill of violets in the design. These folded 5×7 card, blank inside, available in my Etsy shop if you are interested in purchasing some. Thank you, as always, for following my Carrot Condo journey of creativity and cheer. Happy Women’s History Month!! Happy new year to you. I hope 2019 is off to a good start. Do you celebrate the new year? Make resolutions? Or is the 1st just another day? Sometimes the new year doesn’t feel like anything special to me. Other times, it feels good to step forward into something new. This year I’m feeling optimistic, which is nice, so I’m holding onto that feeling for as long as I can. More about this design soon! For Carrot Condo, 2018 was a good year. I had fun making things, I learned a lot during the making-process of each product, and I managed to stay patient enough not to give up due technical challenges. I built up some tenacity in 2018 that has already helped me out in the new year as I continue to tackle technology. So, what about 2019? What do you want to see at Carrot Condo? What should I create? I have ideas. And I’ve already started a few projects. But it helps me to hear what others think. At recent craft bazaars, I got a lot of requests for cat illustrations. Also, my tiny stationery tins nearly sold out (only two left). And my monsters made a lot of people smile and chuckle. I know I whined about how labor-intensive the tiny stationery sets were, but …… I’ve decided to do more. A few anyway. Maybe a few more owls. Maybe cats. Maybe bats. What else? And what are your plans for 2019? What are your thoughts for the new year? I’d really like to hear. You don’t have to leave a message here, if it feels too public. Email, or send me a message in FB or IG. However your year has started, I sincerely hope you have plenty of days of cheer, friendship, and adventure in the year ahead. On Sunday, December 30th, at Nordic Northwest in SW Portland, I will have a table of Carrot Condo creations at Portland’s first “Jolabokaflod,” which means: Yule Book Flood. This is my kind of holiday! Books, reading all night, and hot chocolate? I’m in! For us in Portland, it will be near New Year’s Eve rather than Christmas. In addition to an impressive line up of authors selling their books, there will be Nordic music and fairy tales performed. You can get the full schedule here on Facebook or here on Instagram. I’m excited to be a part of this inaugural event, and I hope to see you there! It’s craft-show season for me at Carrot Condo! The next one is: Llewellyn Holiday Market on Saturday, November 10th from 10am-5pm at 6301 SE 14th Avenue in Portland. Then, on Saturday, December 1, from 10am-3pm I’ll be at the Lewis Holiday Bazaar and Tree Sale at 4401 SE Evergreen Street in Portland. Last weekend’s bazaar at All Saints in NE Portland was great! Friends stopped by, and I caught up with a bunch of lovely folks I wish I got to see more often. Hearing about career changes, new puppies, creative projects, and so much more was so inspiring! I met new customers–one is named Trista! We’re about the same age, and we both said we’ve only known two other Tristas in our lives, so we’re each other’s third Trista. That was pretty cool. And a man in his late 70s or very early 80s stopped by and admired my biking monsters (I have some framed originals as well as this card). My illustrations sparked some memories for him, and he told me about “The Vegetable Man” that came through his neighborhood with a cart and mule when he was a child. The gentleman remembered the vegetable seller’s name and admired his Italian accent as his mother negotiated prices each week. I can tell you this for sure: when I drew my goofy, but determined, biking monsters, I did not expect them to deliver such great stories! These craft bazaars can be a long day for a quiet introvert like me, but I am grateful for the chance to catch up with friends and meet such lovely new customers and fellow vendors. I’ll hope to see you on November 10 or December 1st! Thank you, as always, for your interest in Carrot Condo and my creative work.